Objective: Propose a framework to elicit multidimensional requirements. Materials and methods: A review of the literature is carried out, and the elicitation proposals are analyzed in which the multidimensionality of the requirements is taken into account. Results and discussion: 23 works were found, of which 15 were selected that met the quality conditions and inclusion criteria. 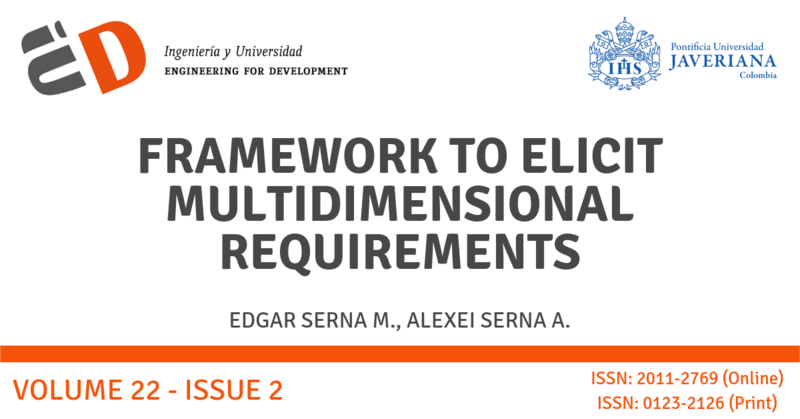 These proposals are related to multidimensionality in elicitation but do not take it into account in order to construct a representative requirement specification. Conclusion: It is evident that there is no unanimity about the dimensions from which the requirements originate, and they have not been elicited. For this reason, and because its existence is accepted, it is necessary to unify criteria and propose frameworks to elicit multidimensional requirements. M. Terstine. “The Progress of Requirements Engineering Research.” Revista Antioqueña de las Ciencias Computacionales y la Ingeniería de Software (RACCIS), Vol. 5, No. 1, 18-24, 2010. A. Alvear and G. Quintero. “Integrating software development techniques, usability, and agile methodologies.” Revista Actas de Ingeniería, Vol. 1, 94-103, 2015. K. Pohl. “The three dimensions of Requirements Engineering.” Information Systems, Vol. 19, No. 3, 243-258, 1994. A. Durán. Un entorno metodológico de Ingeniería de Requisitos para Sistemas de Información. PhD dissertation, Universidad de Sevilla, España, 2000. P. Sawyer and G. Kotonya. Software Requirements. Guide to the Software Engineering Body of Knowledge. USA: IEEE Computer Society Press, 2001. F. Silva, A. Carvalho and J. Castro. “Towards a Methodology for Requirements Analysis of Data Warehouse Systems.” In XVI Simpósio Brasileiro de Engenharia de Software, 2002, 146-161. A. Abelló, J. Samos and F. Saltor. “Benefits of an object oriented multidimensional data model.” Lecture Notes in Computer Science, Vol. 1944, 141-152, 2002. T. Tuunanen. “A new perspective on requirements elicitation methods.” Journal of Information Technology Theory and Application, Vol. 5, No. 3, 45-62, 2003. N. Nurmuliani, D. Zowghi and S. Williams. “Using card sorting technique to classify requirements change.” In 12th IEEE International Requirements Engineering Conference, 2004, 240-248. D. Coleman. “Dimensions of interactive software requirements: Synergistic opportunity.” In IEEE Southeast Conference, 2005, 397-405. A. Moreira, A. Rashid and J. Araújo. “Multi-Dimensional separation of concerns in Requirements Engineering.” In 13th IEEE International Conference on Requirements Engineering, 2005, 285-296. E. Annoni, F. Ravat, O. Teste and G. Zurfluh. “Towards multidimensional requirement design.” Lecture Notes in Computer Science, Vol. 4081, 75-84, 2006. S. Liaskos, L. Jiang, A. Lapouchnian, Y. Wang, J. Sampaio and J. Mylopoulos. “Exploring the dimensions of variability: A Requirements Engineering perspective.” In First International Workshop on Variability Modelling of Software-Intensive Systems, 2007, 17-26. S. Dufresne. A Hierarchical Modeling Methodology for the Definition and Selection of Requirements. PhD dissertation. School of Aerospace Engineering, Georgia Institute of Technology, 2008. N. Kano, N. Seraku, F. Takahashi and S. Tsjui. “Attractive quality and must-be quality.” Hinshitsu: The Journal of the Japaneses Society for Quality Control, Vol. 14, No. 2, 39-48, 1984. N. Pa and A. Zin. “Requirement Elicitation: Identifying the Communication Challenges between Developer and Customer.” International Journal on New Computer Architectures and Their Applications, Vol. 1, No. 2, 371-383, 2011. H. Tran and F. Anvari. “A five-dimensional requirements elicitation framework for e-Learning systems.” International Journal of Information and Electronics Engineering, Vol. 6, No. 3, 185-191, 2016. E. Serna M. “Analysis and selection to requirements elicitation techniques.” In 7th Colombian Computing Congress, 2012, 1-7. T. Gilb. Competitive engineering: A handbook for systems engineering, requirements engineering and software engineering management using planguage. Oxfor: Elsevier, 2004. P. Zave. “Classification of research efforts in requirements engineering.” ACM Computing Surveys, Vol. 29, No. 4, 315-321, 1997. S. Viller and S. Sommerville. “Social analysis in the requirements engineering process: From ethnography to method.” In 4th International Symposium on Requirements Engineering, 1999, 6-13. B. González, J. Sampaio and M. Laguna. “Eliciting non-functional requirements interactions using the personal construct theory.” In 14th IEEE International Requirements Engineering Conference, 2006, 340-341. A. Hickey, D. Dean and J. Nunamaker. “Establishing a foundation for collaborative scenario elicitation.” The DATA BASE for Advances in Information Systems, Vol. 30, No. 3-4, 92-110, 1999. D. Avison and G. Fitzgerald. Information systems development: Methodologies, techniques and tools. USA: McGraw-Hill, 2002. G. Dafoulas and L. Macaulay. “Investigating cultural differences in virtual software teams.” The Electronic Journal of Information Systems in Developing Countries, Vol. 7, No. 4, 1-14, 2001. J. Eveleens and C. Verhoef. “The rise and fall of the Chaos report figures.” IEEE Software, Vol. 27, No. 1, 30-36, 2010. A. Lamsweerde. “Requirements engineering in the year 00: A research perspective.” In 22nd International Conference on Software Engineering, 2000, 5-19. B. Boehm. “The art of expectations management.” Computer, Vol. 33, No. 1, 122-124, 2000. R. Briggs and P. Gruenbacher. “EasyWinWin: Managing complexity in requirements negotiation with GSS.” In 35th Hawaii Intern, Conference on System Sciences, 2002, 1-10. A. Eberlein and J. Leite. “Agile requirements definition: A view from requirements engineering.” In International Workshop on Time-Constrained Requirements Engineering, 2002, 1-5. K. Moløkken and M. Jørgensen. “A review of software surveys on software effort estimation.” In International Symposium on Empirical Software Engineering, 2003, 223-230. E. Morin. “Restricted complexity, general complexity.” In Intelligence de la complexité: Épistémologie et pragmatique colloquium, 2006. E. Serna M. Prueba funcional del software - Un proceso de Verificación constante. Medellín: Fondo Editorial ITM, 2013. B. Kitchenham. Procedures for undertaking systematic literature reviews. Joint technical report. UK: Computer Science Department, Keele University. 2003.